Many food experts believe that Pierre Gagnaire is France’s most talented, inventive chef. My last visit at his Paris temple of culinary delights confirmed that the man is still on a mission. Pierre Gagnaire has undoubtedly come a long way since his youth spent in the Loire, but he didn’t exactly start from nowhere as his family’s restaurant, Le Clos Fleury in St. Etienne, was already a multi-awarded dining destination. After stages with Bocuse and Senderens, Gagnaire returned to the family restaurant in 1976 and kept the standards high. When his father retired, the restaurant closed and Gagnaire opened his own. By 1993 Gagnaire had won all the highest French awards in cuisine. Running a very fine dining establishment in a relatively small market proved a financial challenge and so Gagnaire moved his pots and pans to Paris, where he has known nothing but unbridled success, and is now at the head of a restaurant empire that includes restaurants in Paris (Gaya is the best known, but he has just opened and Italian restaurant too, Piero), Tokyo, Dubai, Seoul, Hong Kong, Moscow, Las Vegas and London, where is part-owner of Sketch in London. Gagnaire’s flagship, beautiful but simply adorned restaurant in Paris, is located on the ground floor of the Balzac hotel in the 8th arrondissement. Tables are set far apart, linens, cutlery and glassware are elegant, and the noise level is extremely low, thanks also to a very plush carpet. 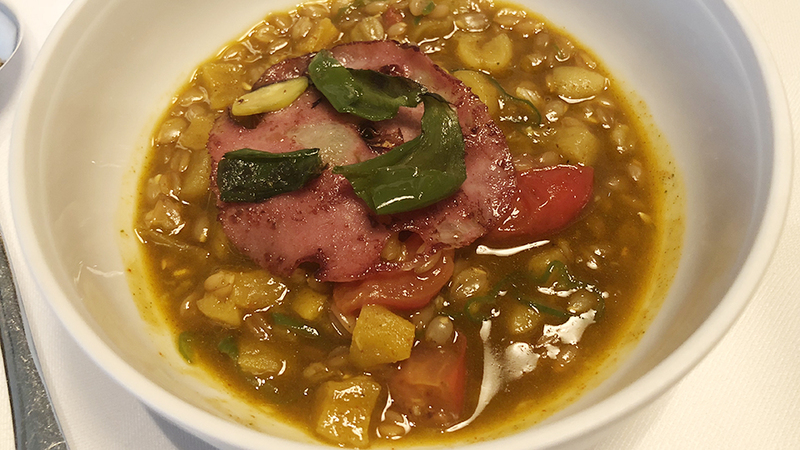 Gagnaire's cooking style is often expressed in a combination of smaller plates and ingredients composing a larger dish (often each main ingredient is prepared in many different ways). 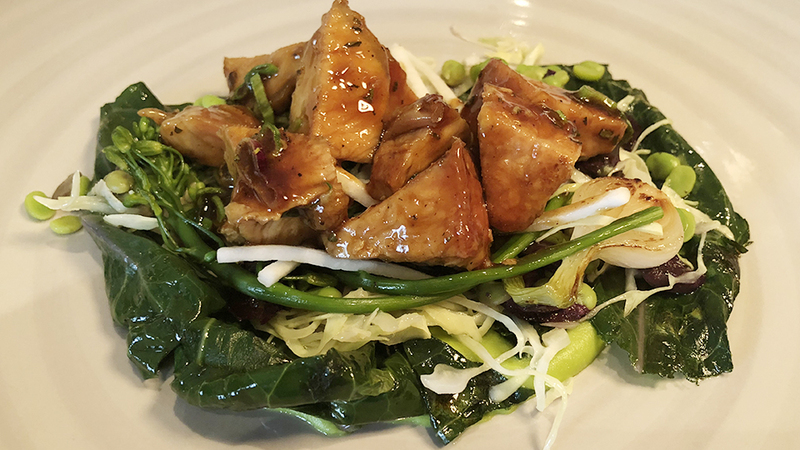 But no matter what you choose to eat, it is easy to marvel at the clever juxtaposition of textures and tastes that are not there for their own sake, but that actually lift each dish to a whole other, much higher, level. Gagnaire’s many other restaurants and engagements means he is often away from the restaurant, so much of the cooking is naturally done by a team of longtime colleagues. 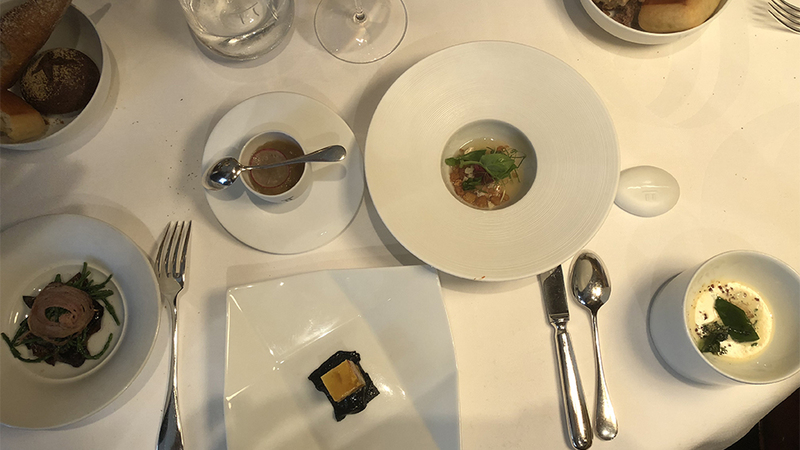 Although this is not an ideal situation, and one that I am usually highly critical of, I also have to say that every time I have had a meal cooked by Michel Nave (one of Gagnaire’s longtime associates), I have come away suitably impressed. 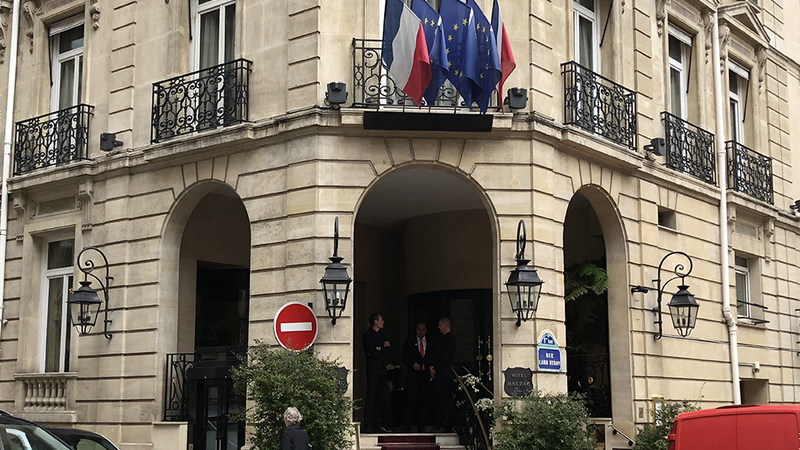 I recently stopped by for lunch while in Paris for a day while in between overseas trips. My meal was simply spectacular, and easily the best lunch of the year thus far (frankly, I doubt anyone else will top it). The beginning of the meal was very fine but not outstanding. The puffed bread, haddock nibbles with squid ink, and the special Peter oyster, Judas ears, and liver were very good but not especially memorable. However, the mackerel gelatin, mussels, and shavings of cherry radish was delightfully delicate and precise, with the crunchiness of the radish bringing everything else together nicely. The poached duck foie gras, radicchio cream, reduced apple juice, and pecorino was a nice and different take in a French classic, and also lighter than many dishes done in this vein. The high notes were reached with the last two dishes (though Gagnaire’s galaxy of desserts is always wondrous). I loved the creamy, herb-rich sauce poulette that complemented the frog meat beautifully, with the Madagascar black pepper further enhancing a dish that is a true concentrate of complex flavors, textures and densities. The Iberian pork with sage and savory, deglazed with Sherry vinegar, was also wonderfully intense, very pure and tender. I could easily have eaten and finished another portion in seconds. The wine list is outstanding, easily one of the ten best in Paris, and better than that of other famous names in Paris such as Arpège or L’Atelier. There is an ample choice of vintages and denominations, and the famous names within it aren’t just from France only, something that further sets this list apart from others in the city. From a difficult, very hot year, the 2003 Trimbach Riesling Clos Ste. Hune acquits itself on this day: layered and complex, with a generosity and a strong inflection of soil that is typical of Clos Ste. Hune in this vintage. Mellow and quite round, but with enough acidity still providing adequate lift, the wine is drinking perfectly well now, but is unlikely to improve or even last much more. There are slight hints of oxidation and a degree of evolution that are unavoidable. 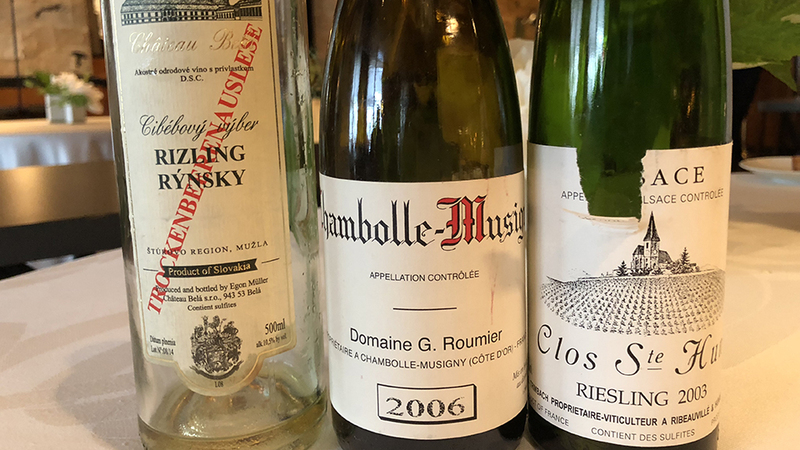 The 2006 G. Roumier Chambolle-Musigny is deep, perfumed and rather silky, and still relatively youthful, with plenty of life ahead. The tension and purity that is so typical of Roumier’s wines is present in spades here, though clearly this village wine lacks the flesh of Les Cras or Les Amoureuses. Egon Müller makes some of my favorite wines in the world, and therefore, besides buying for my cellar, I always try them on any other chance I get. The 2013 Château Béla (Egon Müller) Rizling Rýnsky Tockenbeerenauslese is a Riesling made in Slovakia, where the first vines were planted by the ancient Romans. Château Bela is the old residence of the Ullmann family and is located in southern Slovakia in the Štúrovo region near the Slovak-Hungarian border; its wines are produced in cooperation with Egon Müller and Miroslav Petrech (the latter a well-known winemaker in Slovakia). This 2013 TBA is lighter in style than many of its German counterparts, Mosel included. Although seamless and suave, the 2013 boasts concentrated and very persistent toffee, tropical fruit and peach aromas and flavors, complicated by lemony botrytis. It proves to be a delicate, finely chiseled and marvelous end to my meal.